Cast: Choi Jin Hyuk, Yoon Hyun Min, Lee Yoo Young, Jo Hee Bong and Kim Min Sang. In 1986 Park Gwang Ho (Choi Jin Hyuk), working as an experienced detective, is faced with a serial of killings. Back in the days the term ‘serial killer’ isn’t a popular used word, but Gwang Ho is one of few that notices a pattern. One evening while almost catching the serial killer, he is runs through a tunnel and is hit on the head. While regaining feet he walks back to his station, but is met with an empty station and an unfamiliar face, Kim Sun Jae (Yoon Hyun Min) at his desk. In the confusion he handcuffs Sun Jae, but soon notices that there is something wrong. He slowly realizes, with the help of his junior now team leader, that he isn’t in his own time. He has traveled 30 years into the future, and is unable to get back. Sorry for the lacking summary, it’s hard not to spoil much of this great drama. I really enjoyed watching this drama, even though for the first time ever I disliked both supporting actors. Their characters were unlikeable! I mean for the first 4 episodes I wasn’t interested in their screen time, but as time went by I guess they grew on me. Choi Jin Hyuk was great all the way through – I could totally see him as a man from 1986, by language and how he carried himself. The Yeon Suk and Gwang Ho coupling was so cute, made me not care about any other couples. Story and screenplay is great as well. Unfortunately, I guessed 85% of the drama before the end of, so I was just expecting things to happen by the end of it. But that doesn’t mean everyone will feel that way! So, I would recommend this drama to anyone. What a marathon! I Personally have a liking to all OCN’s crime/mstery themed dramas. 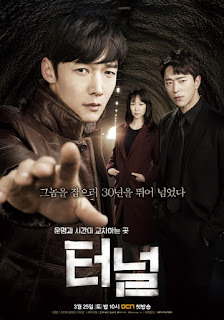 Therefor of course Tunnel was a drama I looked very much forward to. It didn’t disappoint me. The acting was on point, the storyline and the cinematography between the 80’ and present day was really believable. The storyline throughout the drama was very predictable, but I gotta admit the particular cases and crimes throughout was not, at least for me. I liked the suspense a lot, and definitely the teamwork at that police department. Also I agree with Bunji, that Choi Jin Hyuk, was the perfect one for that role. Everything about him screamed the 80’. So to conclude I would say yet again, good job to OCN.